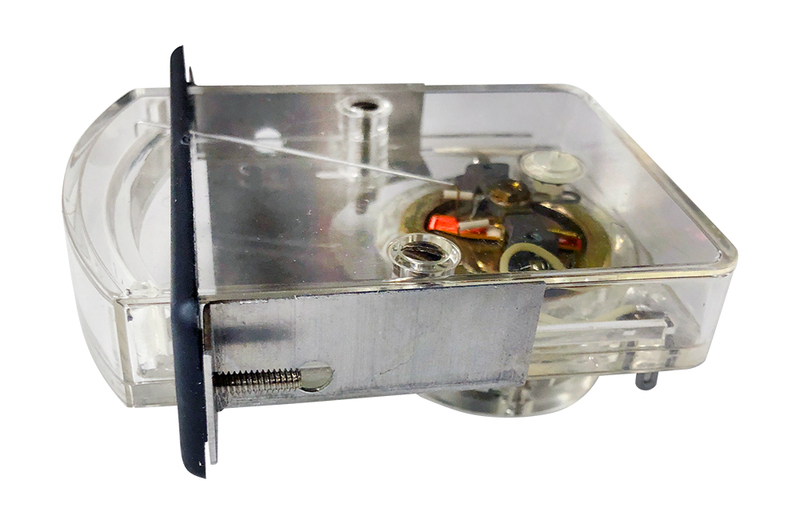 API shielded, sealed, ruggedized meter. High and low set points adjustable from front. 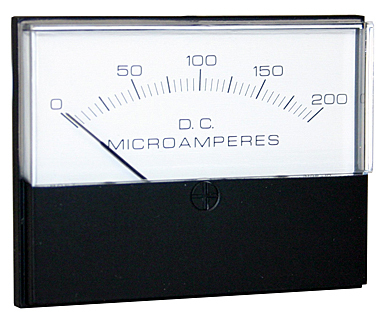 Scale: 0 - 2 (20 µA fs). 2-3/4" face, Fits 2-1/8" hole. API Instruments panel meter relay. 0 - 20 µADC. High limit set point. Bezel measures 2-3/4" diameter. Panel hole 2-1/8", depth 1-7/8". 3 mounting studs. 50ma locking. API hermetically sealed, 0 - 20 µADC. Scale 5 - 15 µADC. Gold (10w) alarm contacts at minimum & maximum stop points. 3-5/8"D face, 2" depth, 2-1/2" hole required. Made for Wilcox transmitter. Bird 43 actual 30 µADC replacement meter. 3-1/2" face. Fits 2-3/4" hole. 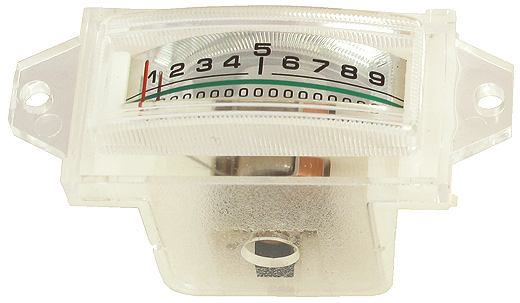 Weston sealed, ruggedized 30 µA meter for BIRD sensors, etc. 3-1/2" face. Fits 2-3/4" hole. Deree 0-50 µADC movement with hardware. FS = 50 µA. 3-7/8"W x 3-1/8"H overall. 3-27/32"W x 1-61/64"H meter face. 1-3/8" behind panel depth. 2-1/2" meter body hole. Sun Electric meter. 0 - 50 µADC. Sealed, ruggedized. 4-1/2" diameter. Requires 3-7/8" hole. 2" behind panel depth. Only one in stock. API dual locking coil meter relay. 0 - 50 µA full scale. Marked from 0 - 20 kw. 3-1/2" diameter. Requires 2-5/8" hole. 2-1/4" behind panel depth. Model 355-C. NOTE: See PDF for full details (Drawing No. 14). NSN: 5945-00-815-5949. 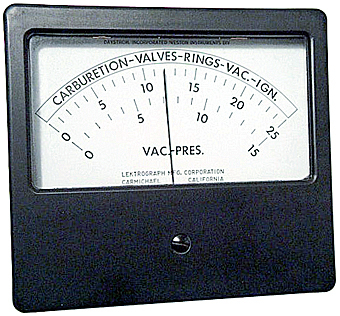 Weston zero center scale meter. Surface mount. 4-1/2" wide x 4" high. 2-3/4" mounting hole required. 1-3/4" behind panel depth. 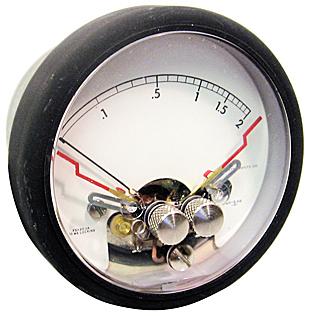 A&M Instruments meter. 50 - 0 - 50 µADC. Sealed. Solder terminals. 2"D hole required. 2-5/8"D face. 1-1/2" behind panel depth. Alt. P/N: SC-C-65558. NSN: 6625-01-049-8565. 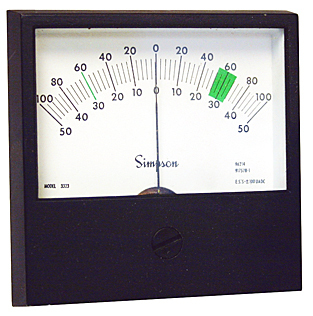 Edgewise meter. 100 µA. Non-linear. Scale reads -40 - 0 +7. 5/8" x 2-1/2" hole required. 2-3/4" behind panel depth. Includes bezel. 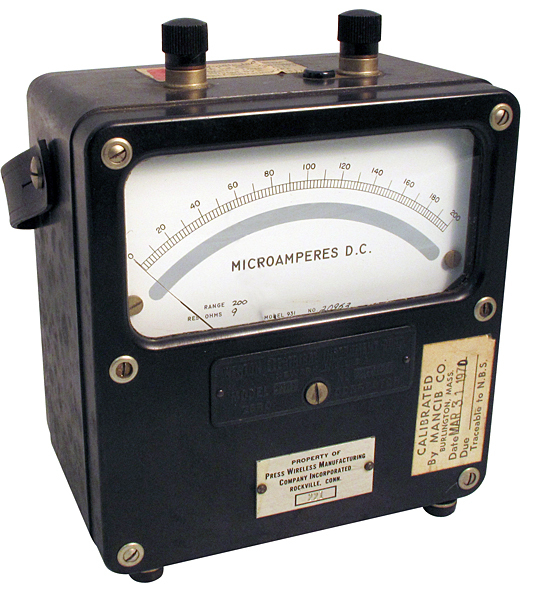 Simpson dual scale "100 - 0 - 100" and "50 - 0 - 50" sealed meter. 3-1/4" square, 2-3/4" mounting hole. 2" behind panel depth. 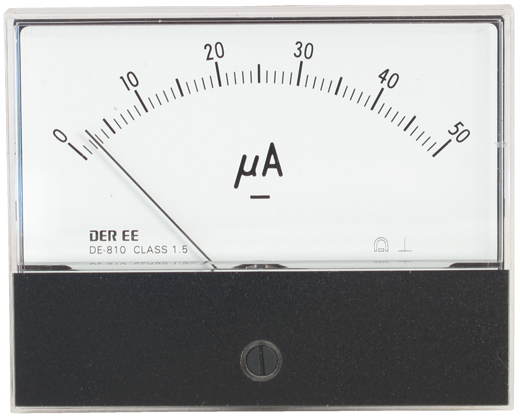 Edgewise meter. 100 µA full scale. 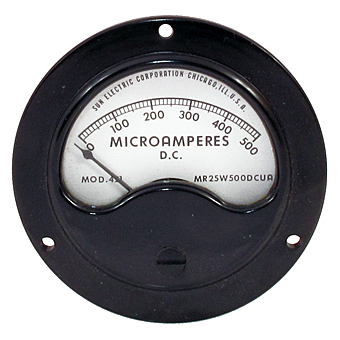 Meter face measures 5/8" x 2-1/2". 3-3/16" overall depth. 1-3/8" overall height. 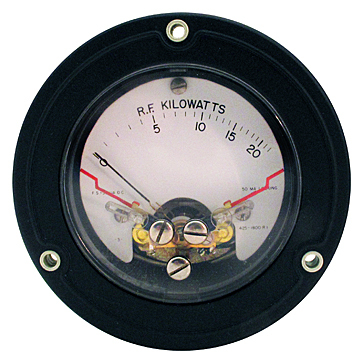 Weston kilowatt meter. 100 µADC full scale. 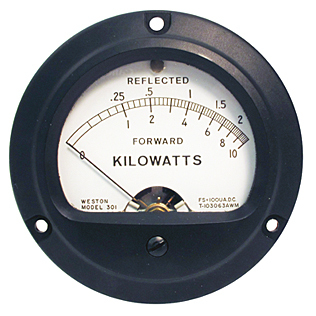 Reflected: 0 - 2 kw, FWD: 0 - 10 kw. Made for use with Bird sensors. Bezel measures: 3-1/2" diameter. Requires 2-3/4"D panel hole. 1-3/4" behind panel depth. 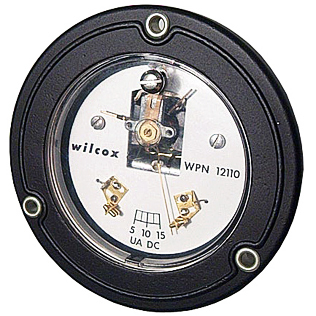 Unique meter relay monitors 100 µA circuit with minimum and maximum alarm contacts (10 watts). Requires 120 vac control voltage. 3-1/2" diameter face, 2-5/8" mounting hole required. 2" behind panel depth. Hoyt - looks like Modutec. Surface mounts w/ 4 corner studs. 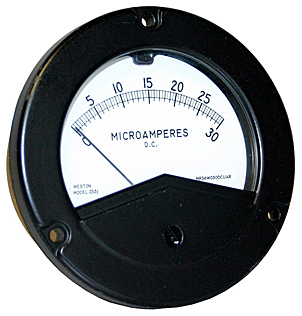 Meter has overall dimension of 2-1/4" high x 3" wide. 1-3/4" behind panel depth. 2-1/16" hole required. 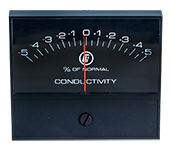 Horizontal reading meter was made by Honeywell for Ameco. Scale has red "B" on left side, black "V" right side. Scale easy to change. Fits 1/2" x 1-3/4" hole. Body 1-7/8" long. Includes separate bezel. We have 500 new in boxes that were discovered in a load we bought from the old 60's powerhouse Lafayette Radio. 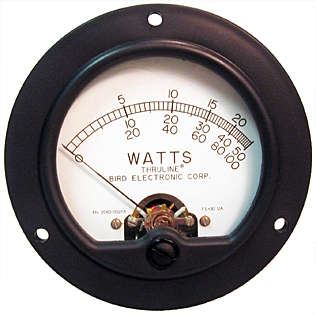 Weston lab meter. 0 - 200 µADC. Top terminals. 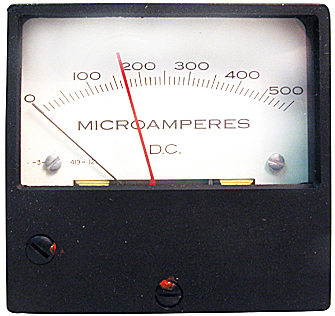 Resistance ohms: 9 ohms internal. Range: 200. 3-1/4" x 5" x 5-1/4"H. Only one available. 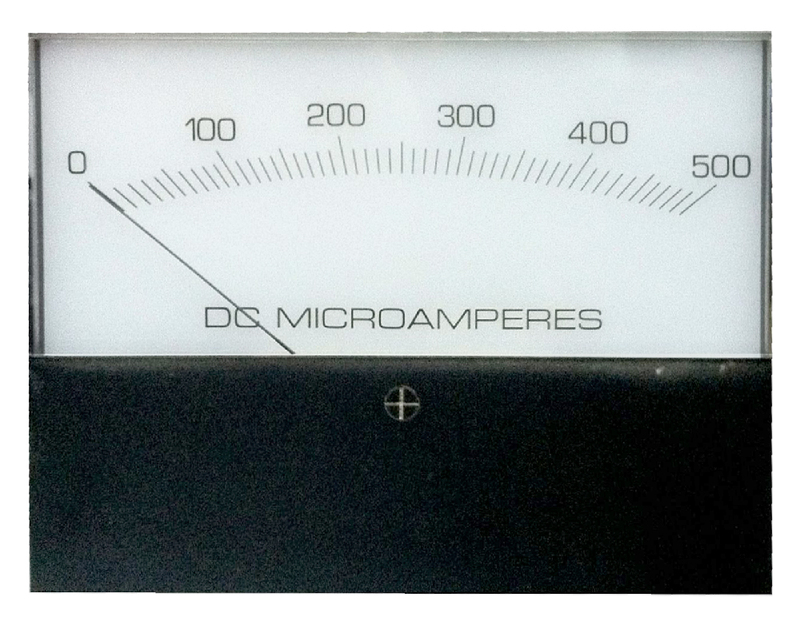 Edgewise µA meter. 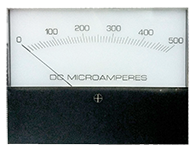 0 - 10 scale, full scale = 300 µA. Tabs mount behind panel depth. 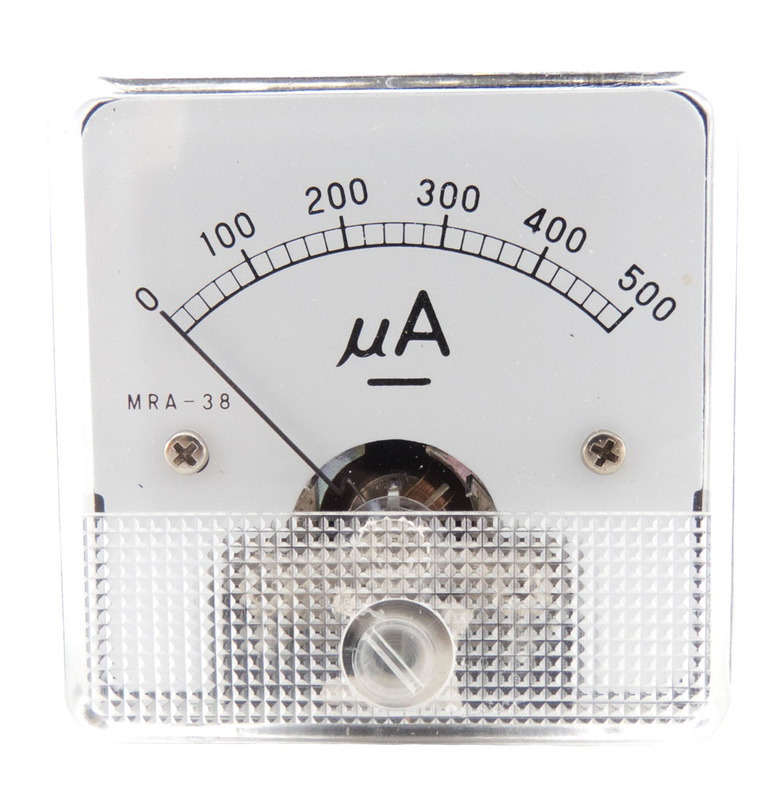 Includes 2N3638A transistor with emitter connected to the negative meter lead. Overall dimensions: 2-1/8" x 7/8" x 1-1/2". Cut-out: 15/16" x 5/8". 1-7/8" c-c mounting holes. 1-1/4" behind panel depth. NSN: 6625-01-177-5266. Made in Japan. 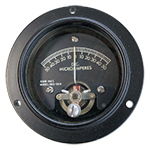 Modutec meter - surface mounts meter has overall dimension of 5" high x 3-7/8" wide. 1-5/8" behind panel depth. 1-7/8" x 1/8" hole mount. 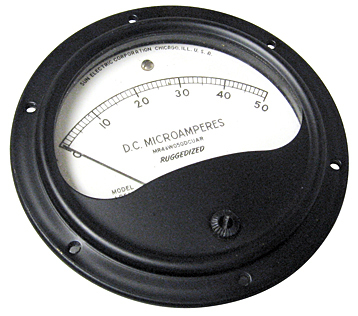 Center scale meter. 500 µADC - 0 - 500 µADC. 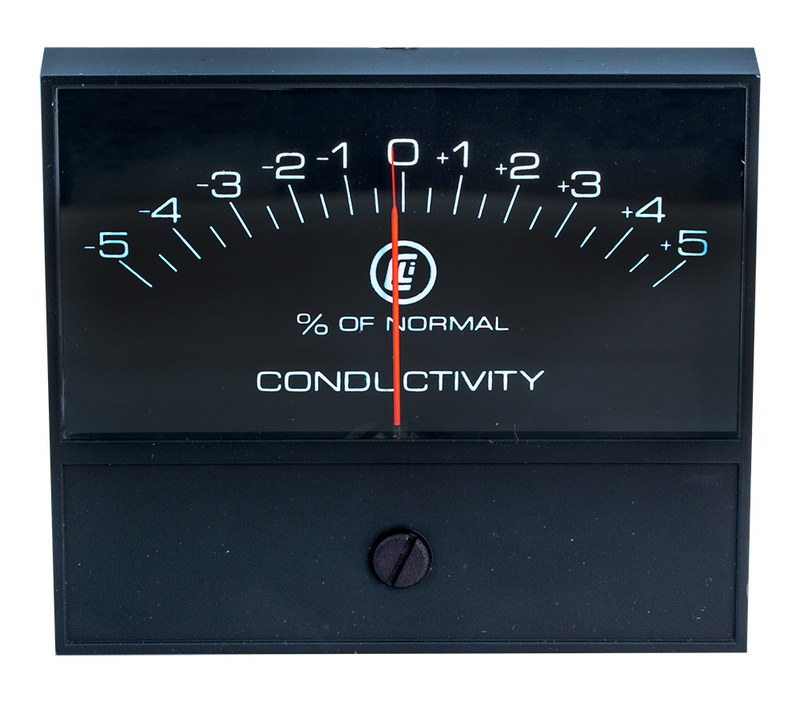 Labeled "% of Normal Conductivity". 3" x 3-1/2" x 1-5/8" behind panel depth. 2-1/4" x 2-1/4" mount centers on corner studs. 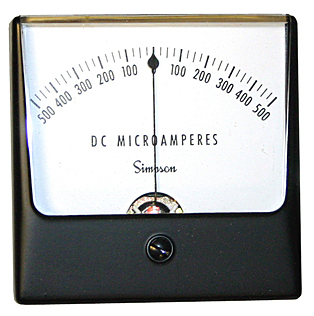 Simpson 500 - 0 - 500 µADC panel meter movement. FS = 500 µA. Includes hardware. Requires 2-7/32" diameter hole. 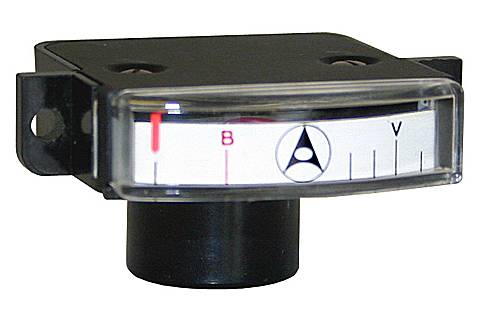 Panel meter. 0 - 500 µADC. 1-5/8" x 1-5/8". 1" behind panel depth. Made in Japan. A Fistell favorite! Deree edgewise horizontal movement. 1-9 scale. 0-500 µADC, 650 ohm. Solder terminals. 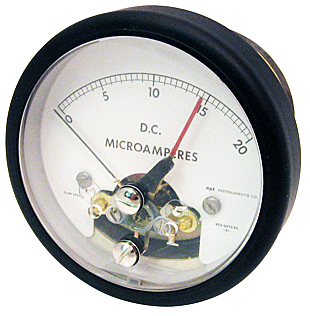 1-1/2"W x 9/16"H meter face. 2-1/8"W x 7/8"H overall. 1" behind panel depth. 1-15/16" hole spacing. 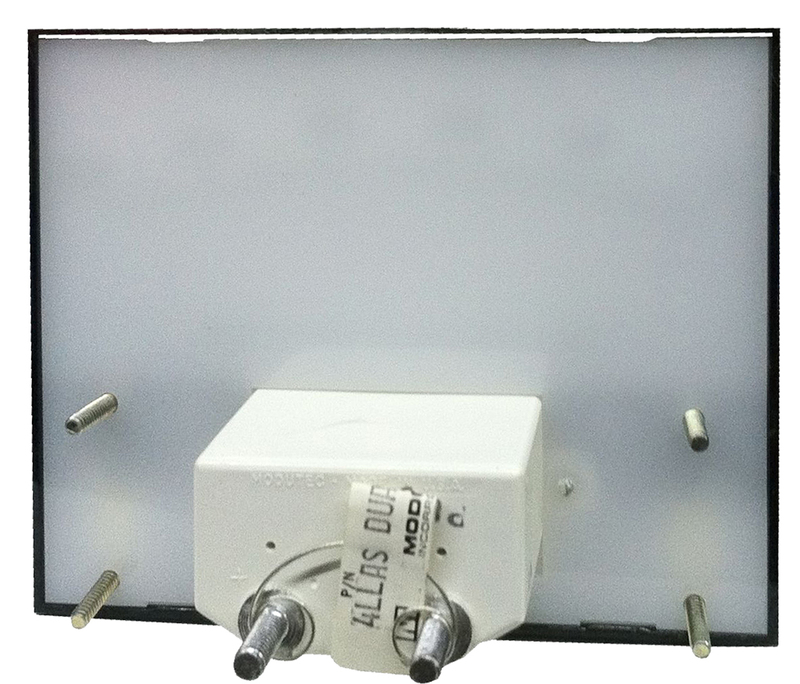 API model 303KV meter relay monitors 500 µA circuit with adjustable set point. 4 sets Hi / LO alarm contacts (5 amp). Requires 115 vac control voltage. 3-1/4" wide x 3" high. 2-3/4" mounting hole required. 5-1/2" behind panel. 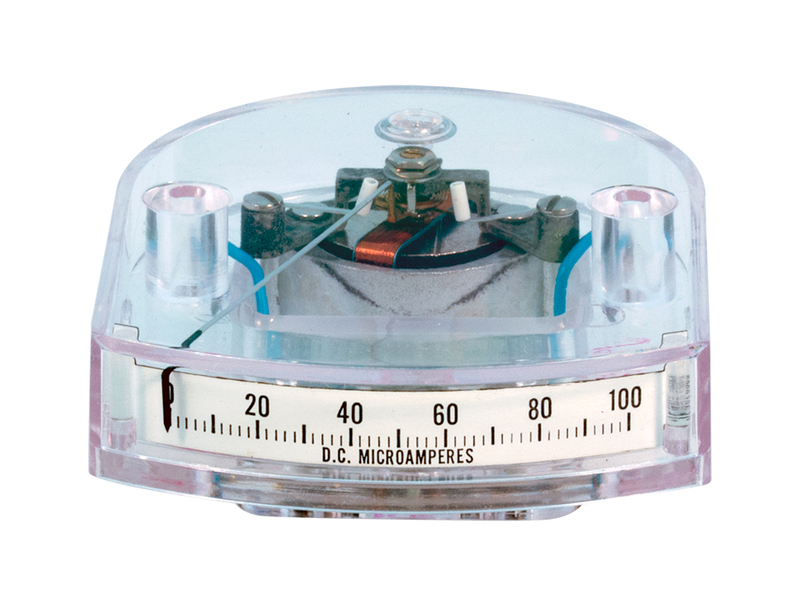 Sun sealed meter has direct scale reading of 0 - 500 µADC. 2-11/16" diameter face, 2-1/8" mounting hole required. 1-7/16" behind panel depth. 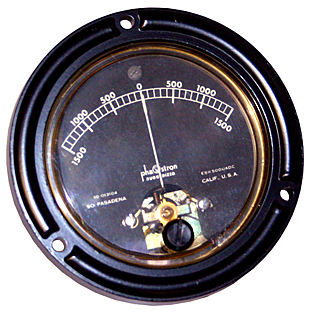 Sun Electric Corporation round panel meter. 0 - 500 µADC. Model 421. 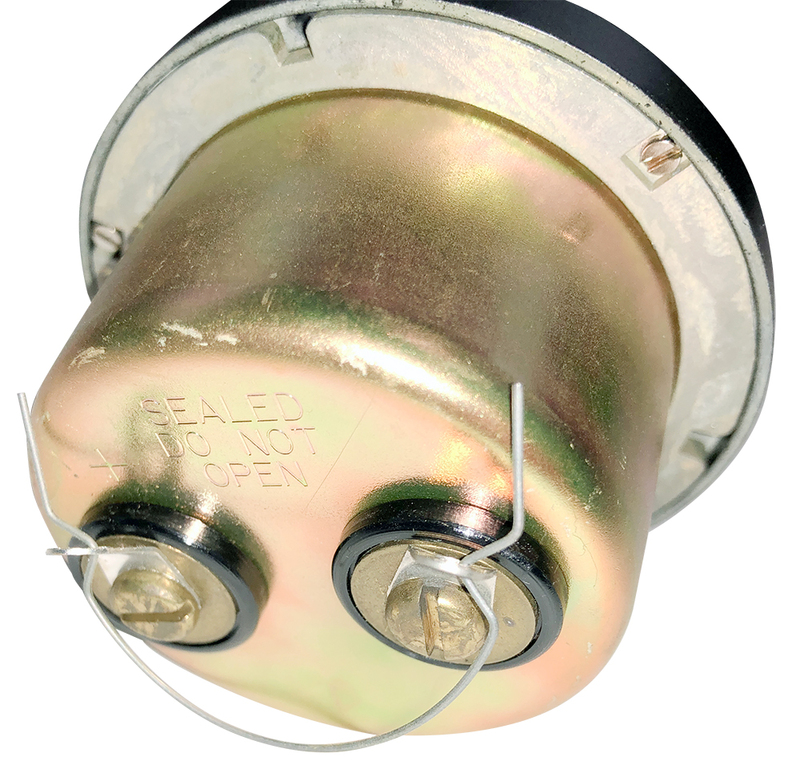 2-5/8" diameter, 2-1/8" behind panel depth. 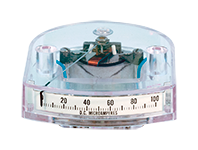 Phaostron sealed and ruggedized meter has scale reading 1500 - 0 - 1500. 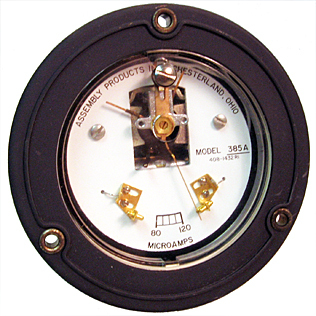 3-1/2" diameter face, 2-5/8" mounting hole required. 1-5/8" behind panel. NSN: 6625-00-534-1980. Weston 500 - 0 - 500 µADC full scale. Scale titled Carburretion - Valves - Rings - Vac. - Ign. - Vac Pres. 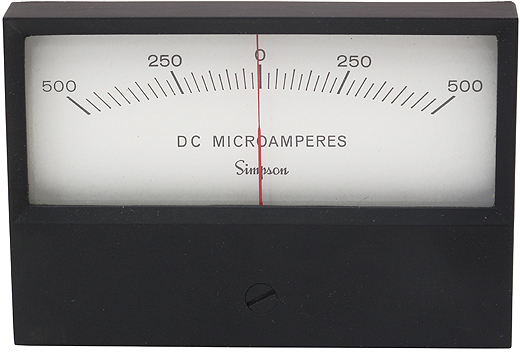 Simpson modern looking meter at a great price. 500 - 0 - 500 µADC. 3-3/16" square face, 2-3/4" mounting hole required. 1-3/4" behind panel depth. New stock in the box! !